M'Ress has three littermates, and comes from a long family-line. Her parents are both honored Caitian citizens. Some wonder if she had a connection to Egyptian goddess Bast-Ra, based on her similar appearance. During her school days, M'Ress specialized in history, sociology, and anthropology, but found difficulty with spatial engineering. Her main hobby all her life was poetry. 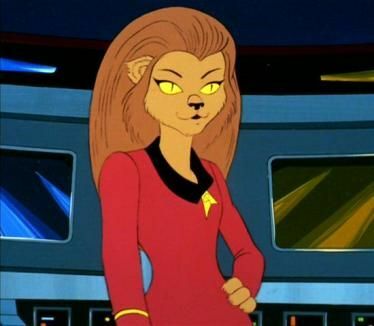 M'Ress attended Starfleet Academy as its youngest-ever entrant, aged just sixteen in December 2260, and was the roommate of a Human female called Lena Goldblum. After her graduation in 2264 - in which M'Ress came 22nd highest out of 400 cadets graduating – M'Ress was assigned to USS Hood as a Third-Shift Communications Officer with the rank of Ensign. When the ship's entire bridge crew were later killed in a Kzinti attack, M'Ress was the highest-ranking communications officer left, and took initiative in deceiving the Kzinti long enough for the Hood to summon help. She earned the rank of lieutenant in only two years and was reassigned to the USS Enterprise under Captain Kirk.